Was in Vik for two nights and had the choice of pretty much two restaurants. Might as well cover the territory. So the 2nd night checked out Strondin Bistro & Bar. Heimalöguð íslensk kjötsúpa – Homemade Iceland traditional meat soup with lamb and root vegetables. 2,300kr. It was quite good. The taste in the lamb was very subtle. 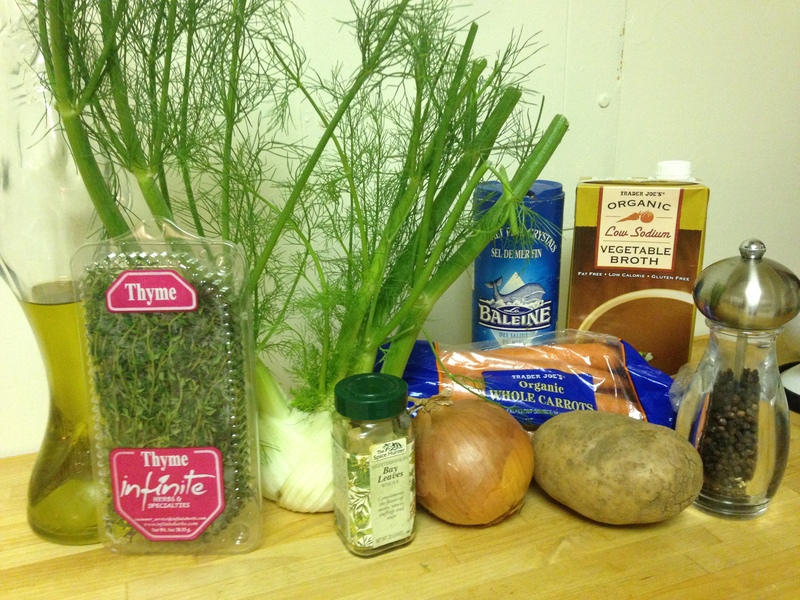 And the rest of the ingredients were potatoes, onions, carrots that were very nice. The warmth brought it all together. Also needed some veggies. Iceland does not have an abundance of these things. But this Strondin place had a Miðjarðarhafssalt: salat m/sólÞurrkuðum tómötum, ólifum, fetaosti, tomötum, agurku og paprika – Mediterranean: salad with sundried tomatoes, olives, feta cheese, cherry tomatoes, cucumbers, and bell peppers. 1,750 kr. That had to be one of the best salads I’ve ever had. Ignoring the lack of veggies the prior few days, the unique combo of sun-dried and ‘regular’ tomatoes in the salad and the dressing it had; SO good! They also had some delicious bread with some kind of herbs in it to make all this even better, that was just brought to the table. Finally, was enjoying all this with a glass of Cabernet Sauvignon, Maronde Pionero from Chile, 1,250 kr. Wine was pricey as usual, but at least since I live in the DC-area, it wasn’t total sticker-shock. What also makes a dinner amazing is the staff. A bit shout out to Antonio, Jan and Lammi. They provided great service, making this dinner even better. Thanks!! So, when you’re in Vik, check this place out. Also, this yellow object started coming out in the sky when we walked out of the restaurant, it was tough to identify. But it provided us this scenery. Even before this crazy snow started falling (so last week), I was searching for soup. It was actually while needing to sit on the couch for several hours watching football. So a recipe I came across to check out was Bon Appetit/Epicurious’s Saffron Fish Stew with White Beans. I love getting something with that sharp color of saffron (and you can find it for a great price at Trader Joe’s). When I came across this recipe it has so many of my favorite herbs. Anything with seafood is wonderful! 1. Heat oil in a large Dutch oven over medium-high heat. Add onion, fennel, coriander, garlic, and thyme sprig; sauté 5 minutes. Stir in rind and saffron; add water, clam juice, and tomatoes. Bring to a boil; reduce heat, and simmer for 5 minutes. Stir in salt, fish, and beans; cook 5 minutes. Top with thyme leaves. This was so quick to make! Served it with some rosemary bread (can’t take credit for making that). Delicious. It’s winter, which means it’s soup time. Was debating what to make the other night and came across a recipe I love that I hadn’t put together for awhile — Posole (from Cooking Light). The true meaning of the word/name is hominy, so that is obviously a must in the ingredients. There are many ways to make it/variations on the recipe. The key is that it has to be made during the the cold weather season. Remove/discard husks and stems from the tomatillos. Cook whole tomatillos in boiling water for 10 minutes or until tender; drain. 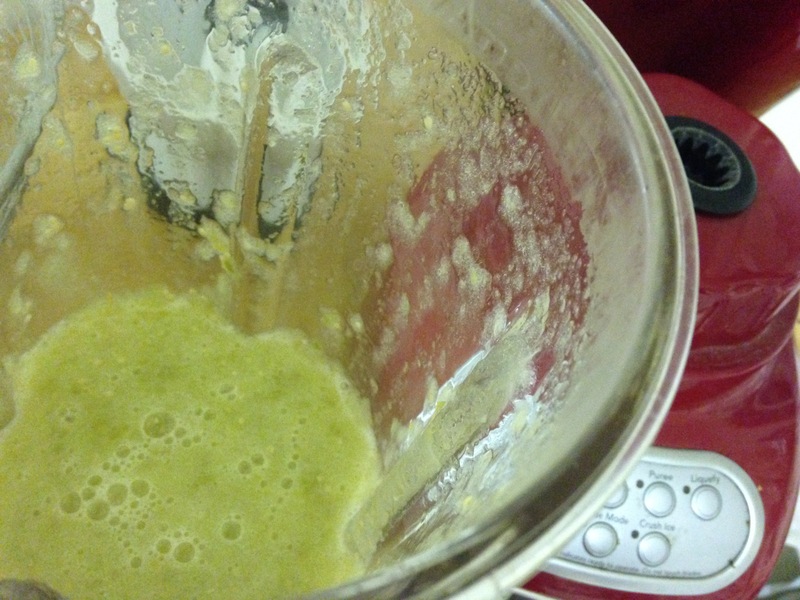 Place tomatillos in a blender; process until smooth; set aside. 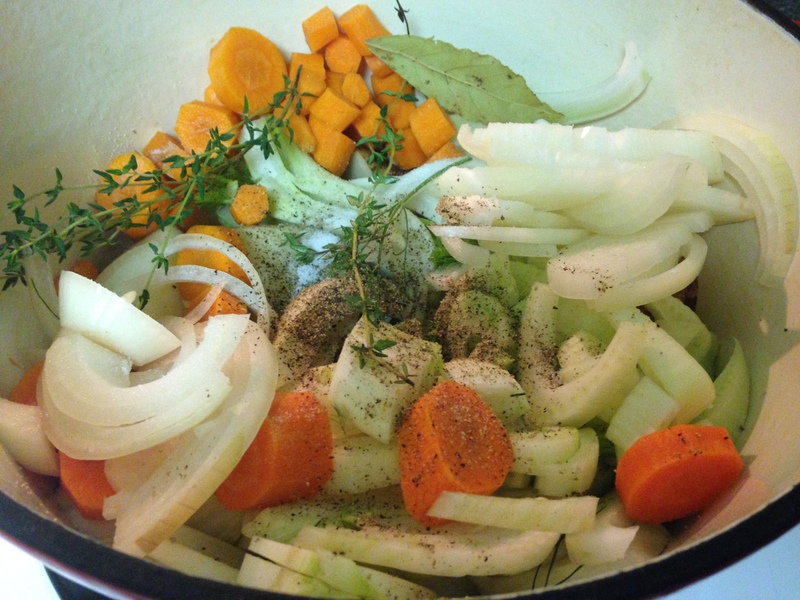 Place stock and the next five (5) ingredients (stock through hominy) in a large stockpot; bring to a boil. Cover, reduce heat, and simmer 35 minutes or until chicken is done. 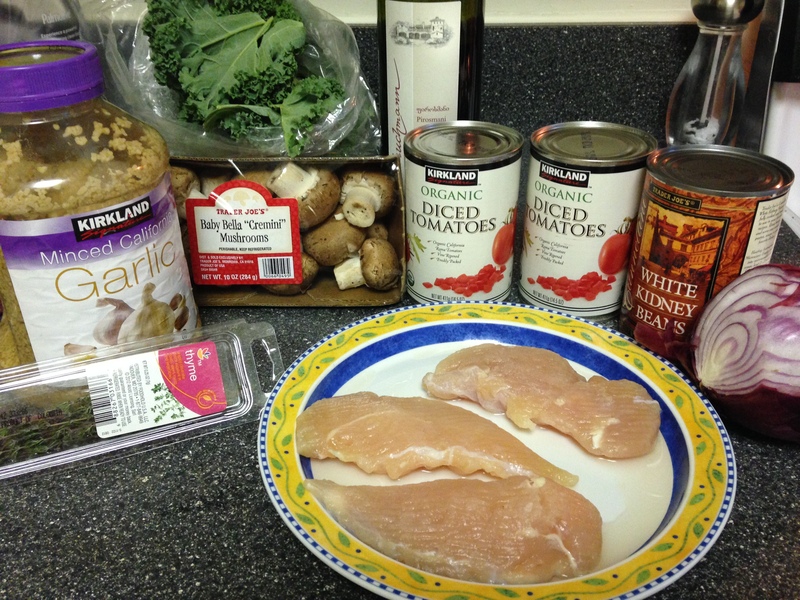 Remove chicken from bones (I have always used boneless — and skinless); shred. 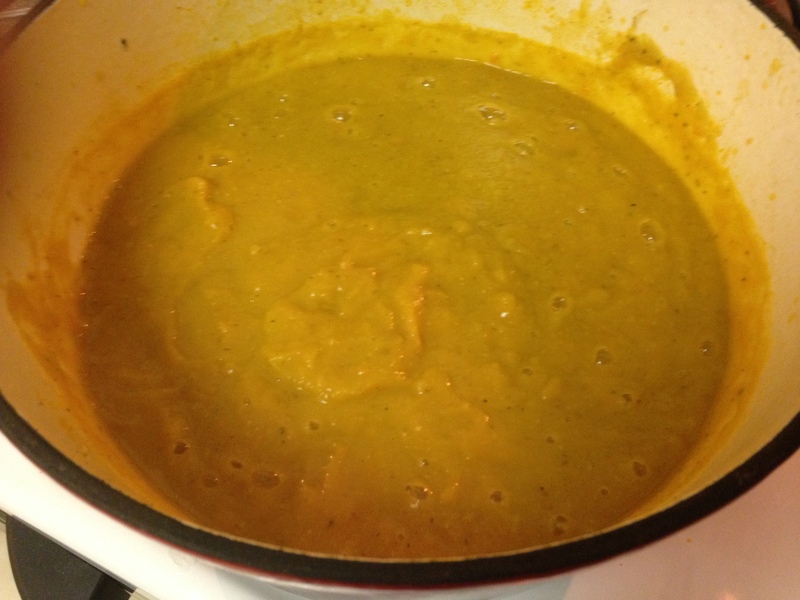 Stir in pureed tomatillos and salt; cook for five(5) minutes or until heated. Stir in chicken, and serve with cilantro, sour cream, and lime wedges, if desired. Delicious! I served it with some guacamole, salsa and chips. I also have plenty to eat for several days or freeze to keep on hand. 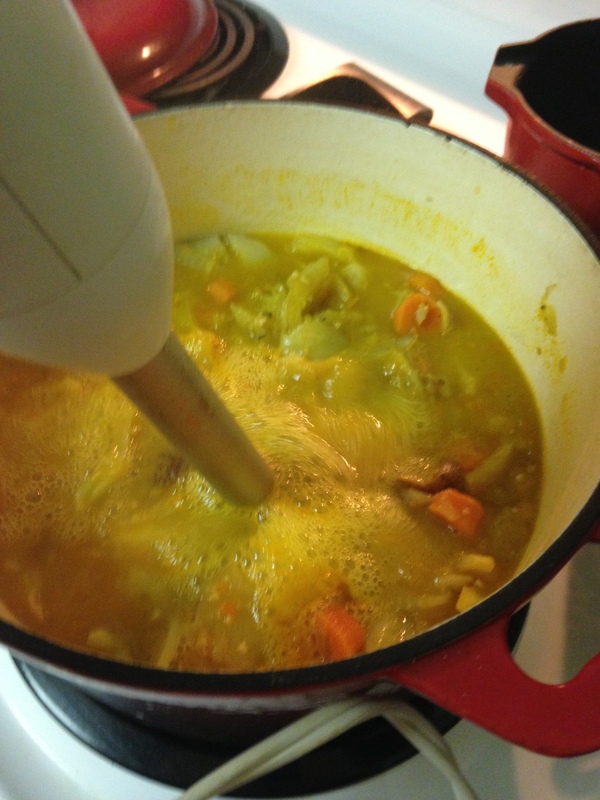 Was in the soup mood last night and remember tearing a new recipe out of the recent issue of Bon Appetit. 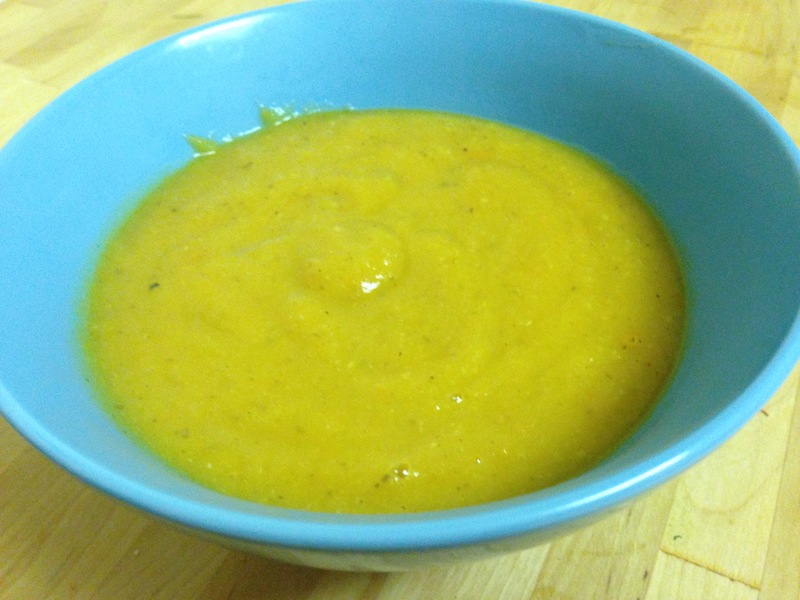 Was the perfect time to make it — Fennel and Carrot Soup. I love fennel and enjoy carrots when they are cooked (or covered in hummus). For some reason I just cannot acquire a taste for them when they are just plain and simple, perfectly orange and raw. We all have our things. Anyway, when I saw the recipe I knew I’d have to make a couple changes/eliminations, which is common in my world since I’m the lactard, but it would be simple. Heat 4 Tbsp. butter (or some oil) in a large heavy pot over medium. 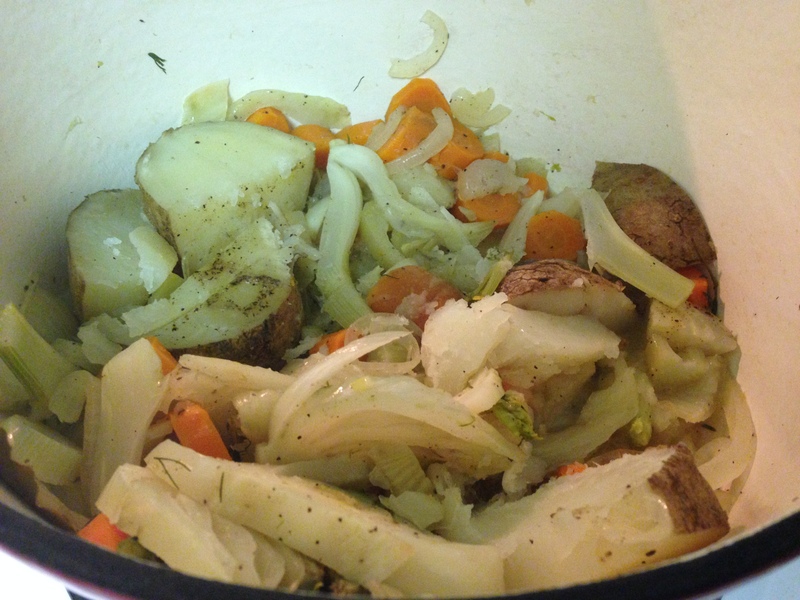 Add fennel, onion, carrots, potato, thyme, and bay leaf; season with salt and pepper. Reduce heat to medium-low, cover, and cook, stirring occasionally and reducing heat if needed, until vegetables are soft but not browned and have released their moisture, 45–60 minutes (this will give them deep flavor). ***Right here I was staring at these delicious looking veggies and questioned sanity — WHY was there no garlic in here?!?! I quickly added some. 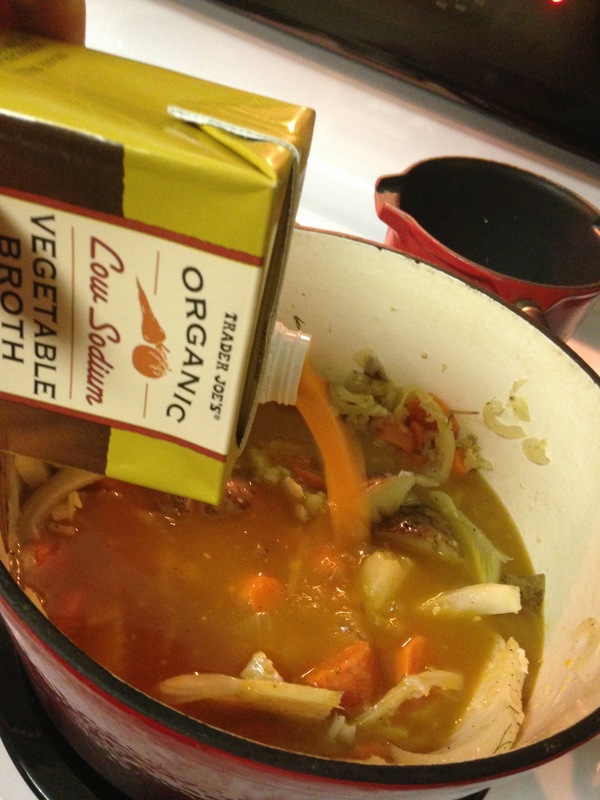 Add broth, bring to a boil, and season with salt and pepper. Reduce heat and simmer until potato is falling apart, 8–10 minutes. Let cool slightly. Remove herbs. Working in batches, purée in a blender until smooth. (Blender??? Immersion blender!!) Strain into a clean pot; season with salt and pepper. (Heat remaining 2 Tbsp. butter in a small saucepan over medium. Add chestnuts and cook, stirring often, until butter is browned and chestnuts are toasted, about 4 minutes. Mix crème fraîche and maple syrup in a small bowl. Serve soup topped with maple crème fraîche and chestnuts. I can’t speak for the last few steps but I’m sure they add quite a bit. But even without them, this soup is AMAZING! Flavor, flavor, flavor! Easy to make, great on its own or with some seafood or meat. I enjoyed it with some chicken. I would highly recommend it. Can likely be frozen, as well. Last Sunday I finally had the time to break in my new kitchen (just moved). So wanted to make something fun. And, the night before I opened a bottle of red wine that did not merit being finished. I don’t really want to waste wine therefore determined I would just cook with it. 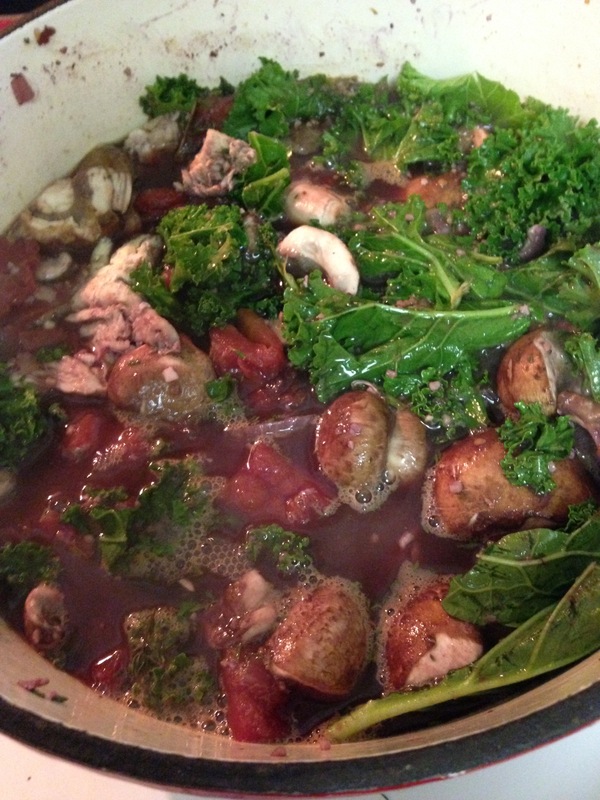 It had been a windy, sort of cold day around DC, so determined I wanted to make a stew-like meal. I did some research online and didn’t find anything that truly struck my fancy so got creative and put together my own thing. I sauteed the garlic and onion for a few minutes then added the chicken and sauteed that until it was cooked. After that I added the balance of the ingredients and cooked it over low heat for about an hour — I was in no hurry. It was a very tasty stew, lots of flavor. 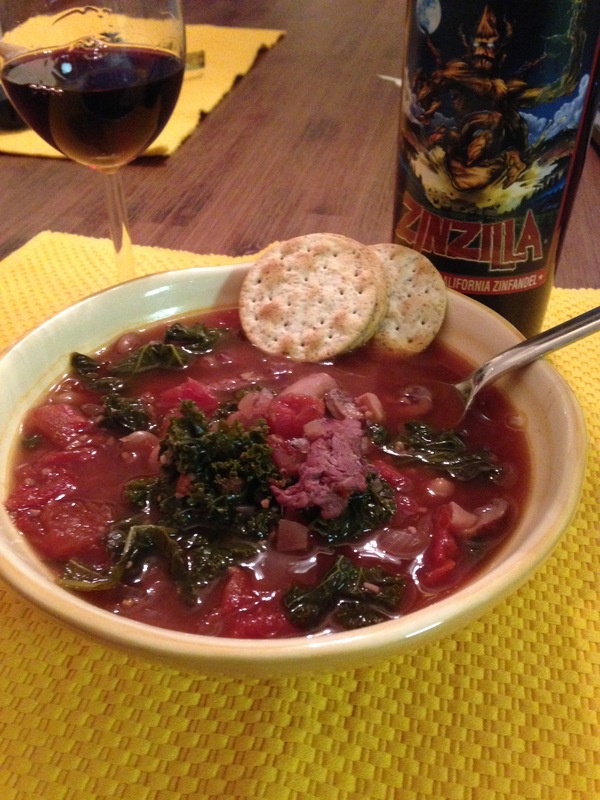 I served it with a quality-of-a-name Zin, Zinzilla. It was a nice wine! Explore in the kitchen! Never hurts to have fun and try something new. The nerve of November to bring cold weather! It has gotten me in the hot soup/stew mood and I finally made some the other night. I flipped through several cookbooks and recipe binders I have and found one that I couldn’t remember if I’d made before so checked it out. 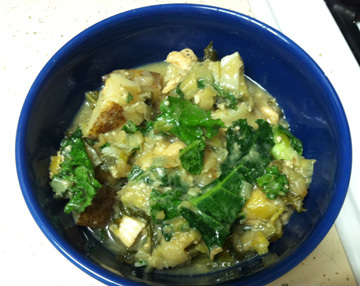 So Monday night I crafted some of Cooking Light’s Dijon Chicken Stew with Potatoes and Kale. It took a good hour+ and was well worth it. First, the aroma of leeks and garlic made my mouth water then the simmering for ‘way too long’ made it nice and warm in my apartment. When I got my first taste, despite my tongue getting burnt (OW! ), very tasty! The recipe says it’s 6 servings and that is a good call. I have been enjoying leftovers for lunch all week. 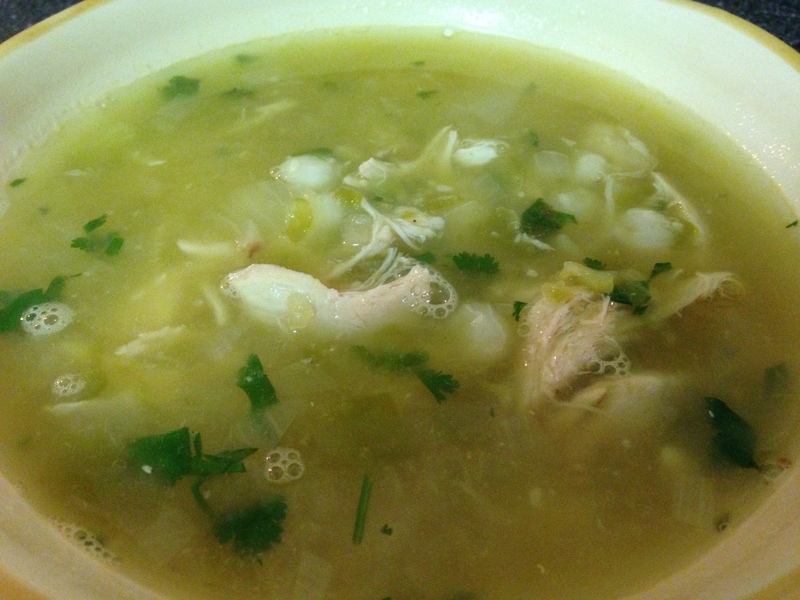 My next thought for soup/stew is either posole or a lemon-type soup a friend gave me a recipe for a couple years back.